Martin Luther began the Protestant Reformation 500 years ago by posting his “95 Theses.” But did this religious revolution restore true Christianity? Oct. 31, 1517, was a day that would change the world. 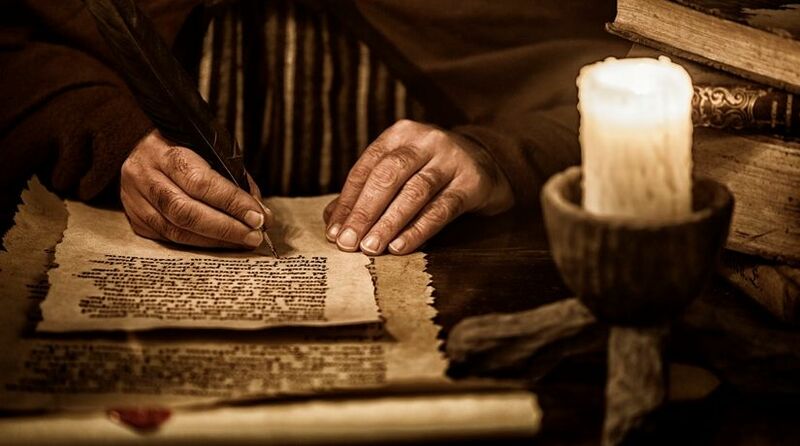 The story goes that on that morning, a monk walked to the door of the Wittenberg cathedral in the German province of Saxony and nailed a parchment to it. This seemingly innocent act would start a movement that would ultimately rupture one of the world’s largest religions and create divisions that still exist to this day. The man was Martin Luther, and the parchment was his 95 Theses. Martin Luther was an instructor of theology at Wittenberg University and a dutiful monk who meticulously practiced everything expected of him (the sacraments, fastings, confession, prayers, study, etc.). Yet the more piously he practiced the tenets of monastic Catholicism, the more dejected and unsure he was of his standing with God. During this time, he went so far as to describe himself as hating God, viewing Him as an angry judge imposing impossibly high standards on human beings. Seven years before posting the 95 Theses, he made a pilgrimage to Rome. Upon his first view of the city, he exclaimed, “Hail, holy Rome!” But he left a month later feeling disillusioned. The city wasn’t the mecca of holiness he expected, but instead was filled with corruption and depravity. He reported that the priests conducted themselves irreverently during the masses, had little biblical knowledge and openly compromised the vow of chastity. This doubt continued to grow for the next seven years—could doing the works taught by the church really justify him with God? He wrote later that at some point during this time, he made a discovery in the first chapter of Romans that changed his life and would become one of his greatest themes—that justification is by faith alone, not by works. That belief became the basis for his attack on the Catholic system of indulgences. It was the issue of indulgences that propelled Luther to write his doubts on parchment and nail it to the church door. An indulgence is an act prescribed by the church to reduce the length of time someone would be punished for sin. An indulgence could be a pilgrimage, repeating a series of prayers or doing some good work. But in 16th-century Catholicism, indulgences were primarily monetary transactions. People would purchase indulgence certificates to release themselves or others from time in purgatory (which the Catholic Church taught was a place where the dead would be punished and purged of sin before entering heaven). The more paid, the more years were wiped off a sentence. This caused deep unrest as people felt pious Germans were being exploited to fund an extravagant building in a foreign land. But those tensions remained mostly under the surface—because it was still, after all, the church. That is, until that October morning in 1517. It was Martin Luther and his 95 Theses (technically titled Disputation on the Power and Efficacy of Indulgences) that brought all these tensions to the surface and began the religious revolution known as the Protestant Reformation. Within months, the text was translated into Italian, French and English and spread throughout Europe and into the British Isles. In this professor and monk, non-Italians who felt exploited by Rome were given an authoritative voice. Martin Luther’s cause received widespread sympathy in the northern German states, not just from the peasants, but from other intellectuals and even Saxony’s sovereign, Frederick the Wise, elector of Saxony. It was Fredrick who saved Luther’s life by giving him safe refuge in Wartburg Castle after he was condemned as a heretic at the Diet of Worms in 1521. While in hiding, Luther wrote extensively. Meanwhile, Luther’s colleagues continued pushing the reformation forward in Saxony. Like a fire, the protest against Rome spread throughout Europe, led by a variety of leaders including Huldrych Zwingli (Switzerland) and John Calvin (France, Switzerland, Holland and Scotland). Although most of these reformers shared some fundamental doctrinal tenets with Luther, the Reformation was not a homogeneous movement. Though most agreed on the necessity of breaking with Rome, it wasn’t long until doctrinal differences divided them. In some cases, the divisions were so sharp that followers of one wing of Protestantism would be banned from an area controlled by an opposing wing. Today Protestantism is divided among thousands of denominations. The Reformation also directly caused the German Peasants’ War (1524-1525) and the infamous Thirty Years’ War (1618-1648)—a long, bloody conflict between the Catholic states led by the Habsburg dynasty and the northern German Protestant states. On the positive side, the Reformation did lead to the translation and widespread distribution of the Bible into local languages. While hiding in Wartburg Castle, Luther translated the New Testament into the German vernacular. Later, this would inspire William Tyndale to translate the Greek New Testament into English, which served as the basis for the 1611 King James Version. There is no denying that another legacy of the Reformation was addressing many abuses and teachings of the Catholic Church. In fact, the Reformation inspired the Counter-Reformation (an attempt by the Catholic Church to moderately reform some of its more obvious abuses). But when considering the legacy of Martin Luther and the Reformation he ignited, there is one primary question that has to be answered: Did the Reformation restore the Christianity found in the New Testament? The reformers often claimed their goal was to reform Christianity to better resemble the original Christian Church (found in the book of Acts). The New Testament gives ample information about the early Church’s beliefs and practices. That Church was unified around the teachings of the 12 apostles, who faithfully taught what they had learned from Jesus Christ and the Old Testament Scriptures (Acts 2:41-42; 17:2; Ephesians 2:20). They truly believed and practiced the truth articulated by the apostle Paul: “All Scripture is given by inspiration of God, and is profitable for doctrine” (2 Timothy 3:16, emphasis added). In order to have truly restored original Christianity, the reformers would have had to totally embrace the Bible as the source for their doctrines and practice. The unfortunate reality is that they claimed to, but didn’t. Luther and the other reformers adopted the Latin phrase sola scriptura (“only Scripture”) as one of their key principles. Studying Luther’s writings reveals that although he paid lip service to sola scriptura, in reality, he did not entirely rely on it and was openly critical of it when it disagreed with his views! In order to find true Christianity, we must open our Bibles and learn what it actually teaches. In addition to the Bible, Luther “repeatedly cited the church fathers—especially Augustine, but also Ambrose, Hilary, Cyprian, John Chrysostom and others—to document his teaching. … Luther did not simply disregard the church fathers; he read them with respect and honor” (James R. Peyton, Getting the Reformation Wrong, 2010, pp. 138-139). These so-called church fathers were the theological architects of the Roman Catholic Church. They all operated 100 to 300 years after the close of the New Testament era and contributed to bringing many unbiblical doctrines into Christendom. Examples of doctrines introduced and defended by these men include original sin, the Church as the Kingdom of God, the adoration of Mary, priestly celibacy, the celebration of Christmas, the Trinity, and rejection of Christians who kept the biblical Sabbath and festivals. Luther also endorsed the authority of the early Catholic councils that established many of the doctrinal positions of Catholicism in his treatise On the Councils and the Church. These councils progressively developed the Trinity doctrine and the celebration of Easter (instead of the biblical Passover)—two unbiblical doctrines Luther (and the other reformers) never protested. Despite his strong statements defending sola scriptura, Luther often questioned, criticized and ignored sections of Scripture that disagreed with his theology. He openly elevated the books he liked—notably the Gospel of John and the epistles of Romans, Galatians, Ephesians and 1 Peter And he scathingly criticized the books he disliked—notably Esther (which he felt was too “Jewish”), Jonah (which he considered a fable), James (an “epistle full of straw”) and the book of Revelation (which he couldn’t understand). In contrast, the early Church viewed the Scriptures as Jesus taught them: “Man shall not live by bread alone, but by every word that proceeds from the mouth of God” (Matthew 4:4). The reality is that Luther did not fully rely on the Bible as his sole authority. His theology included selected portions of Scripture and the teachings of the third- and fourth-century Roman Church. By that time, the Roman Church had already replaced many biblical doctrines with elements of pagan thought and worship. This is an important key to understanding why the Reformation leaders didn’t advocate the changes necessary to restore original Christianity. Minority groups, like the Anabaptists and Sabbatarians, who did try to practice a more biblical form of Christianity were often ostracized and persecuted by the mainstream reformers. The gospel. Jesus taught “the gospel of the kingdom,” a message about the establishment of a world government under His rule and how mankind can become a part of it (Matthew 4:23; Mark 1:14). Catholicism suppressed this message by teaching the Church is the Kingdom. Luther taught that the gospel was simply the story of what Christ did for us and how man can be justified by faith. The Sabbath and festivals. Jesus, the apostles and the early Church observed the seventh-day Sabbath and biblical festivals. Catholicism abandoned those observances beginning in the second and third centuries and replaced them with Sunday and holidays taken from paganism. Martin Luther maintained Sunday and vigorously attacked Christians who kept the seventh-day Sabbath. Nearly all Protestant denominations today continue to keep the observances established by Rome instead of those instituted in the Bible. Christianity and works. Jesus taught that Christians are to strive for perfection (Matthew 5:48) and obey the 10 Commandments (Matthew 19:17). The Roman Church added many nonbiblical works for salvation, while compromising major points of the original 10 Commandments. Martin Luther correctly protested many of the unbiblical works added by the Roman Church, but he fell into another ditch of relying solely on faith (sola fide) and attacking the necessity of the works God requires. This is why he bristled at the epistle of James (see James 2:20, 26). These are just three examples that show Luther, and the other reformers, had valid reasons to protest Catholicism—but did not go far enough to biblically correct them. Instead of restoring the truth, they maintained many erroneous teachings and introduced some of their own. To this day, Catholicism and Protestantism remain far different from the original New Testament Church founded by Jesus. Jesus said His Church would never die out (Matthew 16:18). In order to find true Christianity, we must open our Bibles and learn what it actually teaches. This requires abandoning the fallacies of popular religion and studying God’s Word with a humble and teachable attitude. Discern magazine and LifeHopeandTruth.com are supported by people around the world who are striving to do just that. We are here to help. As we look back at the Reformation 500 years later, it should remind us that false teachings should be questioned. But, if we are going to protest error, we have to be willing to fully replace the false with the truth. Martin Luther didn’t do that. The other reformers of his time didn’t do it. But you can.